The main Moscow State University building. A total of 55 Russian higher educational institutions have made it to the list of the world’s 250 top universities in the BRICS member-countries. Russian universities have come second in terms of representation in the list of the world’s top universities in the BRICS member-countries (Brazil, Russia, India, China and South Africa), according to the QS World University Rankings published by the British company Quacquarelli Symonds Ltd on Wednesday. A total of 55 Russian higher educational institutions have made it to the list of the world’s 250 top universities in the BRICS member-countries. Russia is second only to China represented by 86 higher educational establishments. 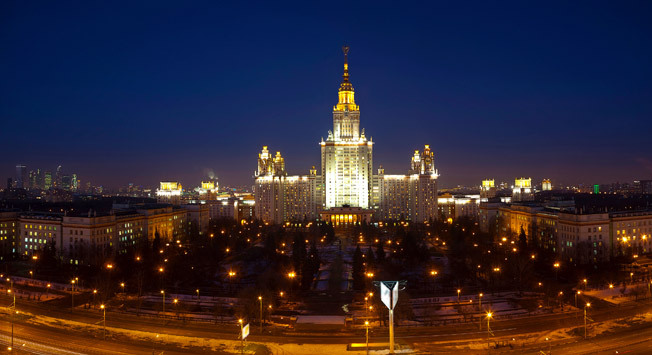 The best Russian university represented in the rankings is Lomonosov Moscow State University, even though now it ranks 7th (compared to last year’s 4th place). The list of Russia’s top ten universities also includes St. Petersburg State University and Novosibirsk State university (sharing the 20th place), Bauman Moscow State Technical University (38th), Tomsk State University (43rd), Moscow State Institute of International Relations (44th), Moscow Institute of Physics and Technology (48th), National Nuclear Research University (Moscow Engineering Physics Institute) (50th), Peter the Great St. Petersburg Polytechnic University (61st) and the Higher School of Economics National Research University (62nd). Chinese universities confirmed their dominance in the rankings led by Tsinghua University (1st) and Peking University (2nd). The 2016 ranking has been extended to feature the top 250 BRICS universities (compared to 200 in the previous lists). Brazil and India now have 54 and 44 entries respectively (compared to 40 and 31 last year). South Africa has 11 universities featured led by University of Cape Town (14th place).